While living in California, one of my friends would hold an annual truffle party every year in early December. She would invite several friends over, provide the chocolate truffle base, and have us bring various toppings such as almonds or cocoa. We all had a wonderful time making and rolling truffles over a glass of wine and much chatter. 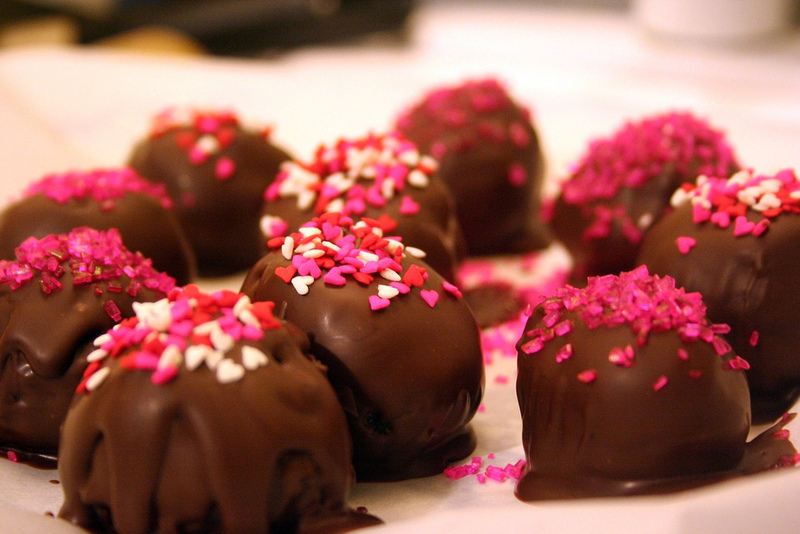 As the chocolate holiday is rapidly approaching, what better way to say I love you than homemade truffles? They are fairly straight forward and super delish! Melt chocolate in double boiler or follow directions for microwave melting on package. Be careful not to let water drip into chocolate or it ruins it. Combine milk chocolate, dark chocolate, scalded cream, and liqueur or extract. Beat until well mixed. Refrigerate until solid. Remove from refrigerator and bring to room temperature. Chocolate should be fairly solid. Shape into balls. Dip into dark or light chocolate coating. Set onto waxed paper. Sprinkle with favorite topping. Let set until coating hardens. Store in sealed container. * I usually mix these up and refrigerate overnight. * Pouring your truffle base into a round container makes it easier to make balls later. * Depending on the extract or liqueur you use, the chocolate may end up being a bit soft. In this case, you roll it into balls and then pop it in the fridge again for a few minutes to help it solidify. Then you can dip it in the coating chocolate. If it gets too cold, the dipping chocolate will crack after it dries. * You will get messy and it helps to wash your hands after awhile or the truffles start to stick to you. * Kids can help with the rolling part. Older kids with the dipping part. * I use a cookie dough scoop to help shape the truffles. They come in various sizes but I wouldn’t go any bigger than a tablespoon otherwise you will need a gallon of milk to drink per truffle. * I use a fork and toothpicks to dip. I drop a truffle in the dipping chocolate, swirl around until covered, and then slide the fork underneath. I then tap the fork on the side of the bowl to help remove excess chocolate and use a toothpick to slide it off the fork. You can also buy fancy chocolate dipping tools . * You can purchase cute candy boxes and candy liners or mini cupcake liners to make your truffles look fancy. I haven’t tried all of these flavors, but have found them various places. Our favorites are kahlua, peanut butter, peppermint, and cherry. Experiment with the flavor combinations. Add more or less of the liqueur or extract. Be creative and use your imagination, after all chocolate goes with almost everything!